I finally got a makeup mirror and it's honestly probably my favourite part of my room. My parents actually bought this for me as part of my 22nd birthday gift (see post here) and I couldn't be more obsessed with it. Do you know when you really love something but kind of get over it because you think you'll never be able to get it? Well thats how I was about these makeup mirrors, I would just lust after them on pinterest but that would be as far as it went. 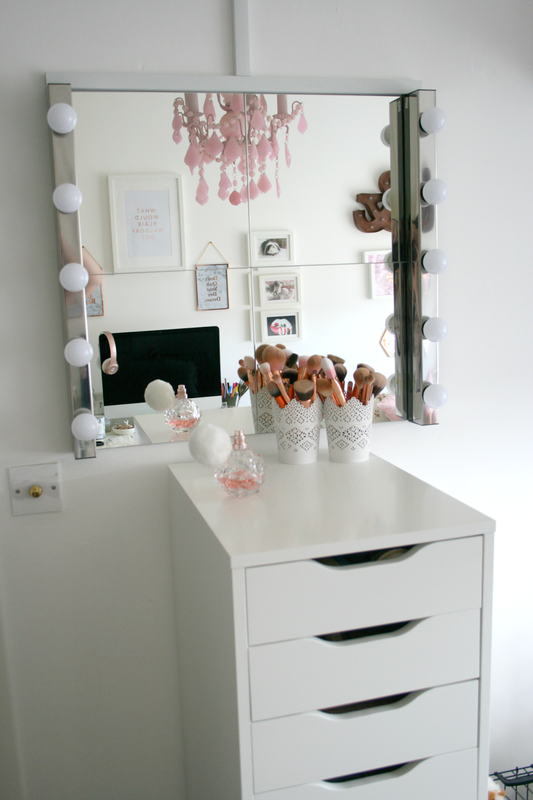 The light it gives is extremely bright and it just makes doing your makeup that bit more fun! I knew I wanted storage for my makeup and so I bought the ever so famous Alex 9 Drawer and I'm ashamed to say that 7 of the drawers are currently full with makeup...and thats after I had a clear out. I will do a makeup collection post in the near future, I just have to get around to tidying them all so that they're presentable for photos! If you are on the look out for storage I 100% recommend this because there is so much room and it also looks really pretty. So I'm sure by now you're all sick of seeing my bed, from instagram to blog photos but you know there is a wall behind it that you often don't get to see! 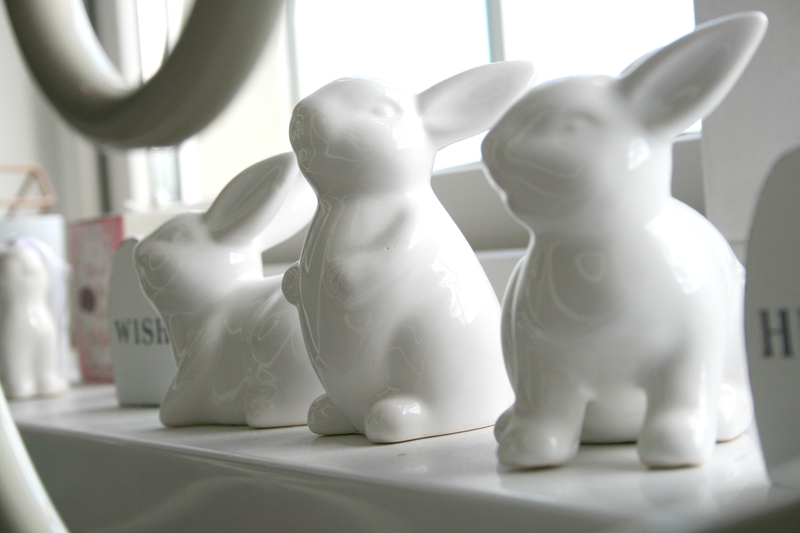 The Bunnies on my windowstill are all from Lidl about a year ago, they came out especially for Easter but they're way too cute to pack away. Plus they go with the whole white theme I've got going on. 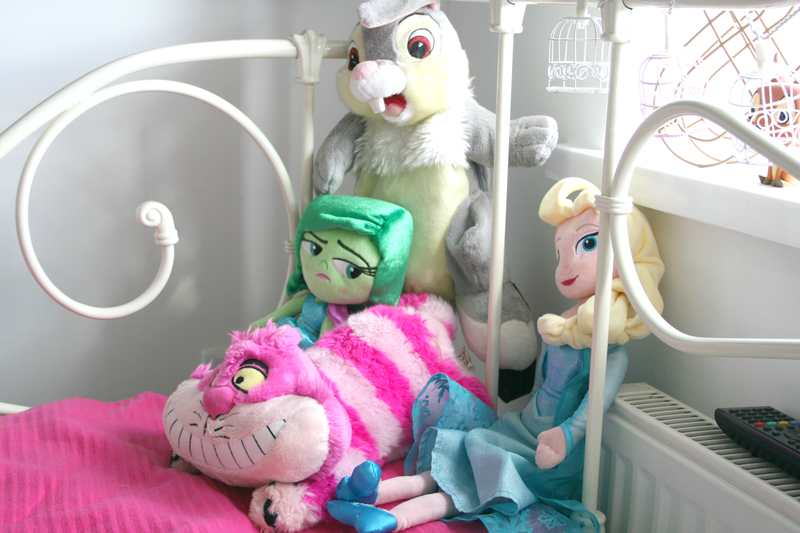 Of course the Teddy's are all from the Disney Store and one of my most FAQ...the Thumper cushion is from Tesco! I know I know, adorable right!? I'm not too sure if they still have them as I got him two years ago now. 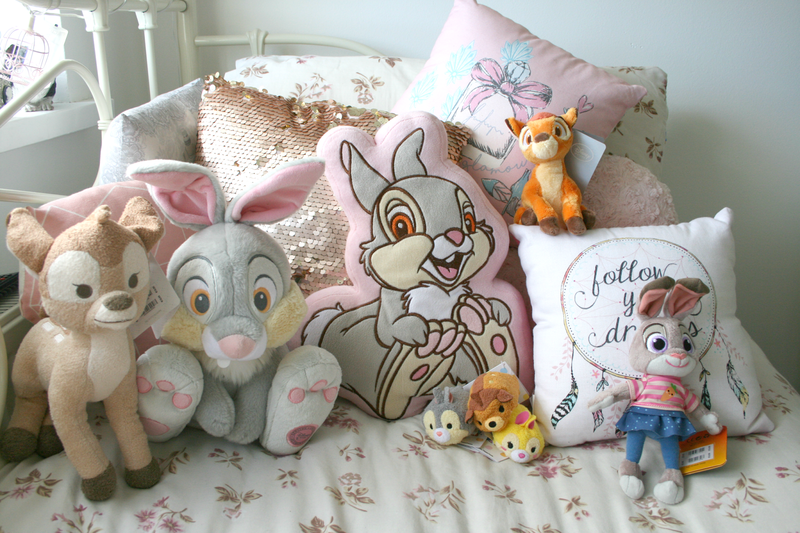 The other cushions are all from Primark, seriously though they have the cutest cushion selection and I always have to stop myself from buying more! 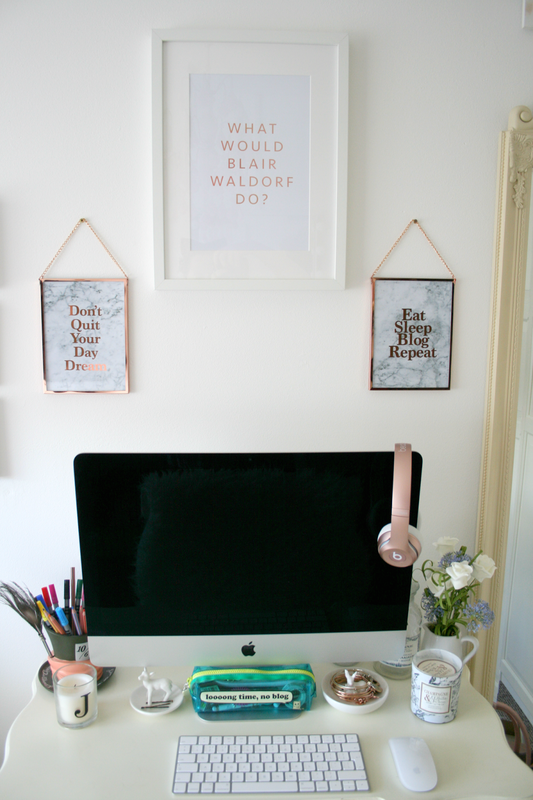 They currently have a marble one in and I kind of want it for my desk area, giving into the blogger cliches and all that! The wall above my bed I'm kind of obsessed with it's simplicity and colour theme. Most of the things in my room are either white or copper (if you haven't already noticed) and I just adore these three items. The & sign lights up and wait for it...I got it in ALDI!! Yes thats right Aldi, they got in the cutest homeware bits and they were the best colour themes ever and I basically bought everything they had that was copper. 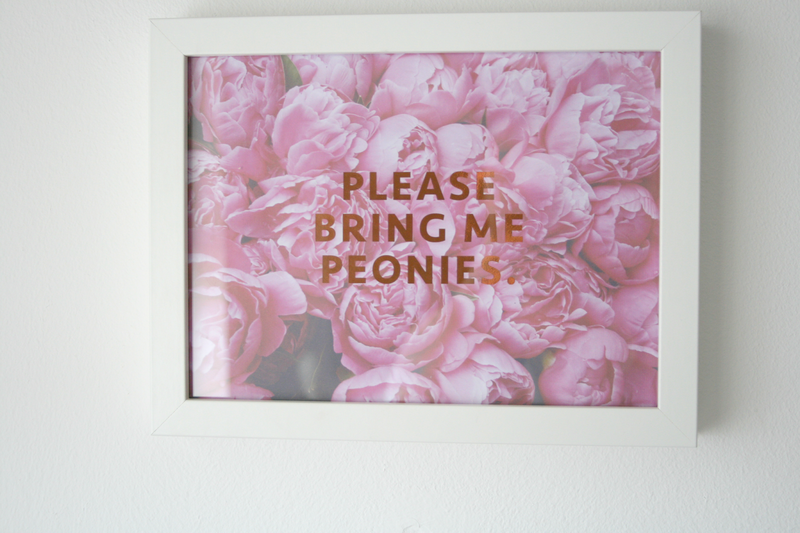 The Peony print I ordered from LilyRoseCo and I must say I am obsessed with it and the copper foil writing just adds that extra little something. 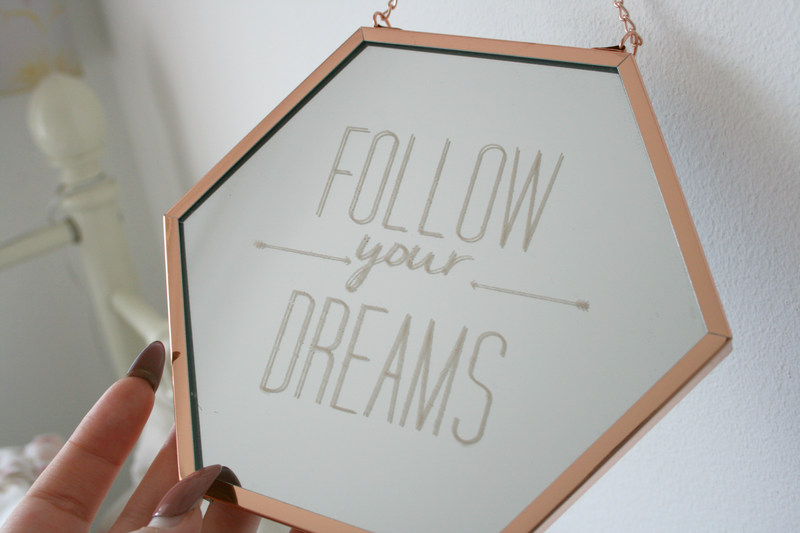 Finally the little mirror is also from Aldi, I instantly fell in love with it when I seen it, not only do I love the saying but the fact that its a little small copper framed mirror is just fab. It's like they knew I was decorating my room and needed some copper homeware because it couldn't have come in at a better time. The shoe prints are from Tk Maxx, my Mum picked these up for me when I was about 16 but I didn't appreciate them back then and they were put up into the attic. While in the middle of shopping online looking for some sort of print for that wall I remembered them in the attic and they couldn't have worked out any better. 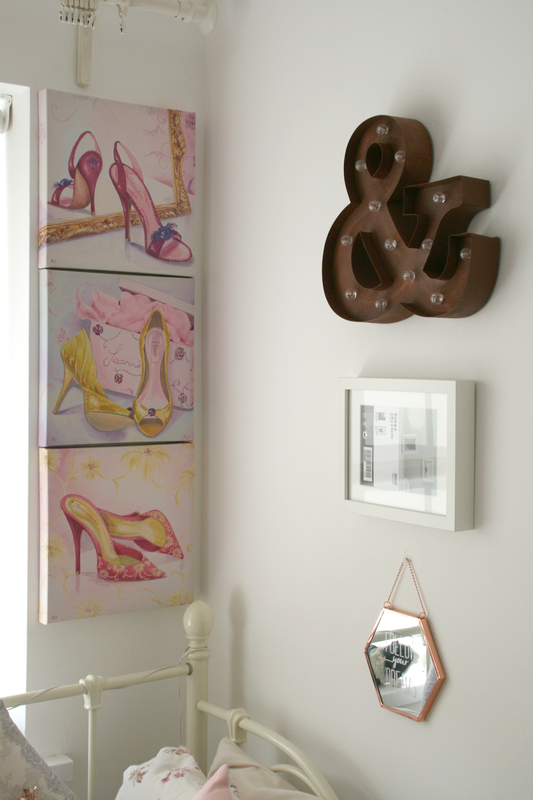 They're kind of the pop of colour in my room and give it a little girly feel. I adore them now that I'm older and appreciate homeware. 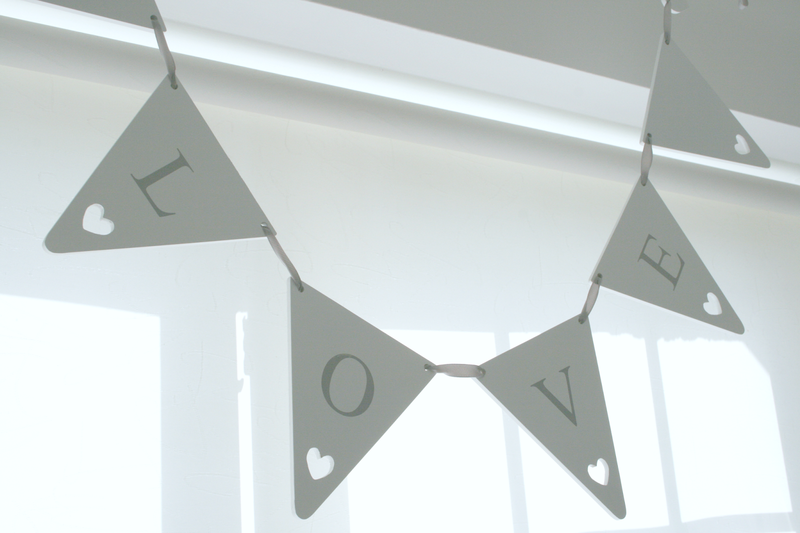 The Love Garland I have hanging from my curtain pole just as I don't plan on getting any curtains anytime soon and it was looking a little dull. But I don't think this could have went any more perfect as it wasn't even planned. I also got this in Aldi and when I bought it I had no idea where I was going to put it and was almost about to leave it, but I'm so glad I picked it up now. I always knew that when I done up my room I wanted a Blair Waldorf print. After getting my iMac last year I knew I wanted it to be above and centre of that, and finally I have it! When hanging it up my dads exact words were "whats a Blair Waldorf anyway?" 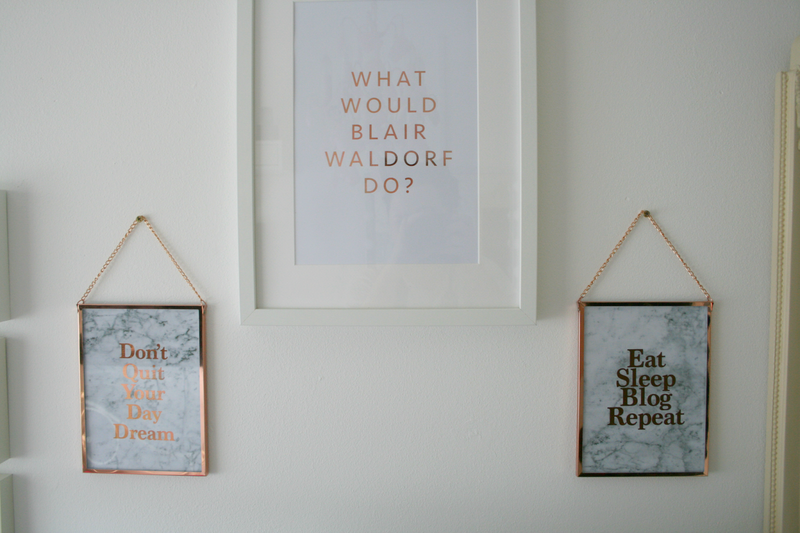 *facepalm moment* The Blair Waldorf print was also from LilyRoseCo along with the two marble prints too! I couldn't have found a better website for prints to be honest, they're affordable and have so many to offer, definitely recommend having a look at if you're on the look out for some. Of course I had to get some sort of print regarding Blogging and as soon as I seen the Eat,Sleep,Blog, Repeat one I knew it was the one...because well its pretty true. 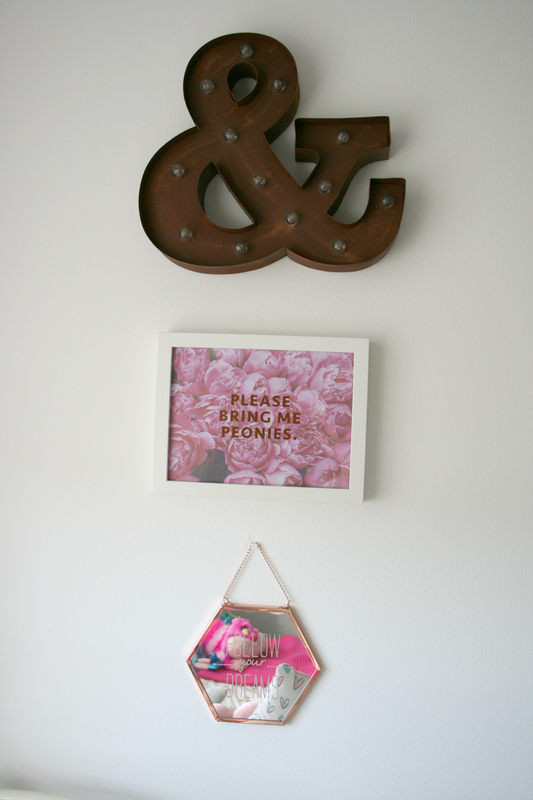 I was also so happy about the Daydream print as it's one of my current favourite sayings. I'm actually really happy with my desk space at the moment, I was going to buy a proper desk while in Ikea but decided against it because my vanity table just goes so well with the room. The chair is a simple white chair from Ikea and I simply bought a rug (yes a rug!!) and threw it over it and it just looks so cute I love it. And thats it really. The wall not included is the wall with my wardrobe but I already had that, it's one of the build your own from Ikea and it's just full of junk. Does anyone actually have an organised wardrobe because I don't think I ever had! 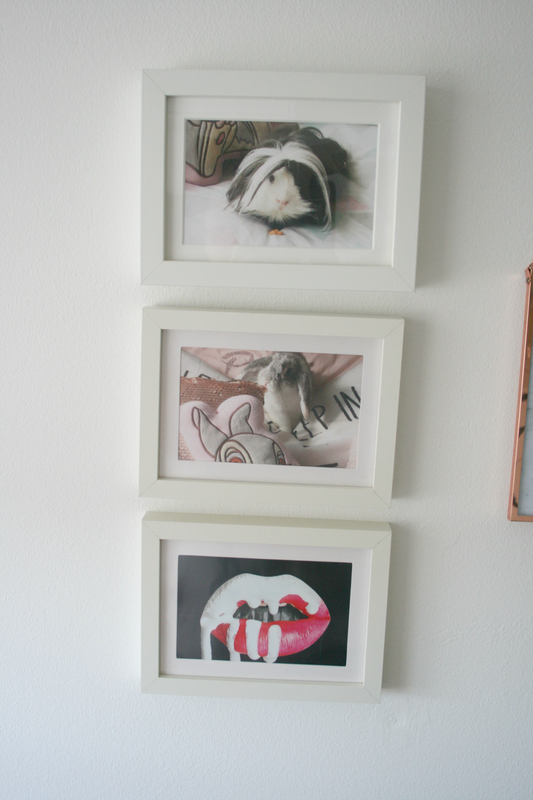 The frames on my walls are all from Ikea (white) and the two Copper ones are from...you guessed it Aldi! Seriously you should check out Aldi's homeware stuff because it is all seriously fab! Anyways thats it all done! Throughout writing this post I realised just how dreadful these photos look that I took but hey I tried. 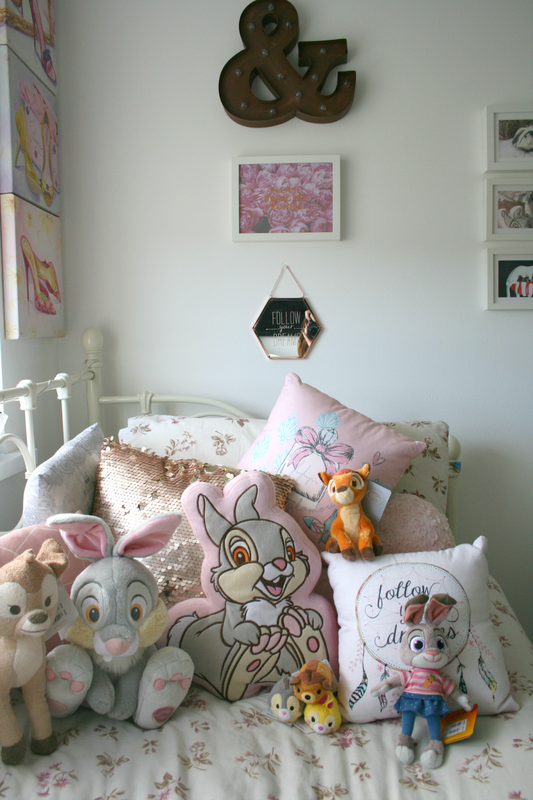 Anyways hope you's liked having a nosey into my newly decorated room, I'm pretty obsessed with it and love having a room I'm actually proud to show people! 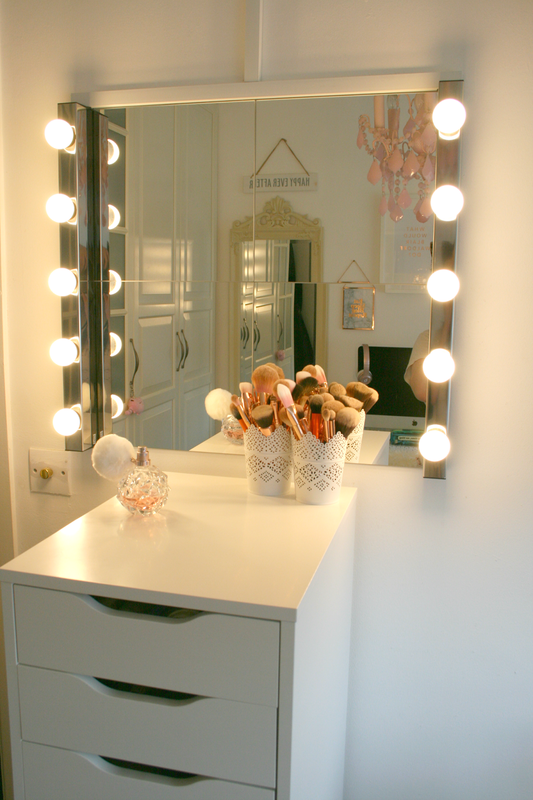 Your room looks gorgeous ahh - so many things I now want for my room haha! Oh my gosh everything is so gorgeous and the prints are stunning! 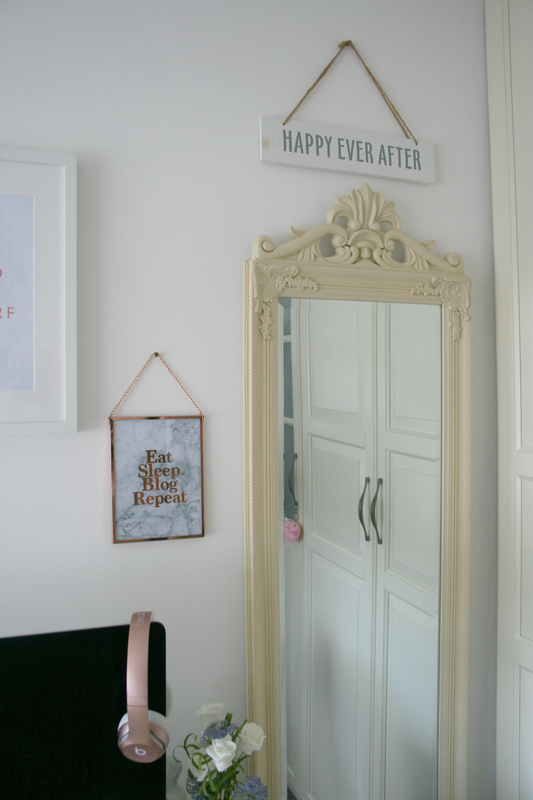 I am in love with your room! 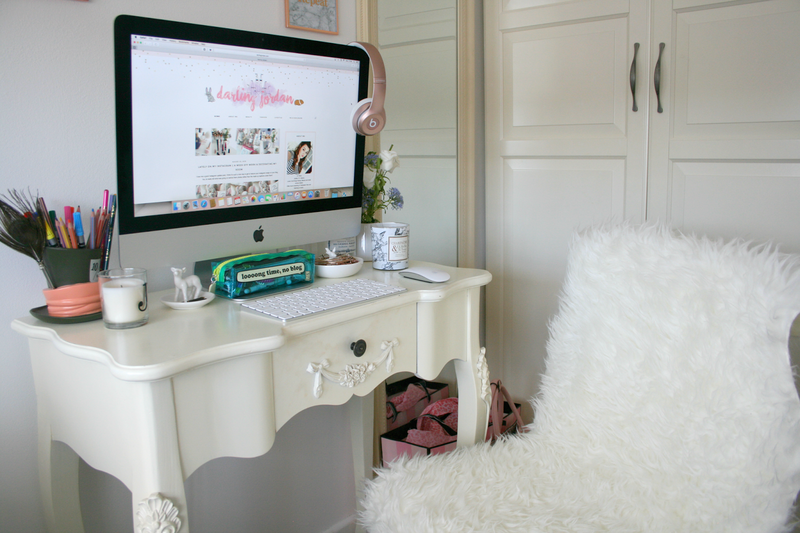 Your desk area is like something from Pinterest. You have the best Disney toys too! I love this! I recently redid my room white and pink and love it. It feels good to redo your room so it feels more grown up and stylish. Aw this is so cute! 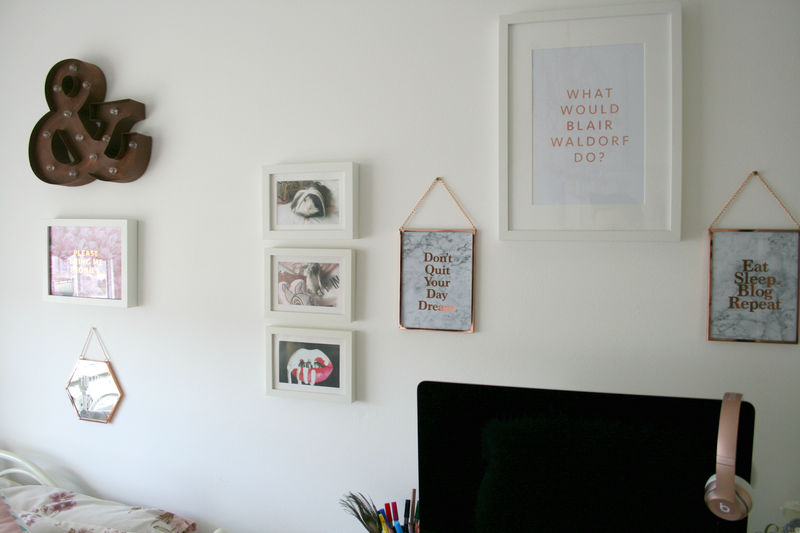 I especially love that Blair Waldorf print, not even slightly ashamed of how many times I've seen Gossip Girl haha!